So, to break my recently established, injured-person's lifestyle and actually leave the house for something other than work, I took a long overdue vacation with Steven, and we went up to Tuolumne Meadows. Considering how many times I've visited Hetch Hetchy in any season, or how often Steven and I have visited the Valley in winter, it doesn't seem like I should have much of a connection to TM. But you don't know that all winter, I read the weekly dispatches from the winter TM rangers at the Tuolumne Meadows winter conditions page, where I watch the snow pile up, week by week, and then read about avalanche conditions, wildlife sightings, long nights, and then the long, long effort to get the Tioga road cleared of snow (and boulders, and downed trees) by July of each year. All the places I love to hike share similar conditions to TM, and so I live vicariously through the rangers (who, unlike me, can cross country ski) until the road to the high country is open, and backpacking season is REALLY here. On our first afternoon, after blowing a hose on the way into the park, being trapped in a turnout until the car cooled down, and having to take a side trip to the garage in the valley to procure replacement hose for Steven to install, we made it to camp, and milled around the meadows themselves for a while. That was pleasant. The second day, we hiked from the Mono Lake trail head up to Spillway Lake, Parker Pass, and Mono Pass. 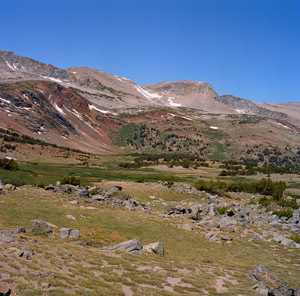 (The two photos posted here are from that trip: the top one is a view of the peaks on the way toward Parker, and the lake is a small, nameless lake very close to Parker Pass, and quite close to Helen and Spillway lakes.) The air was stunningly fresh, the birds were singing, snow was melting into creeks, marmots were posing on rocks, and the landscape was stunning. 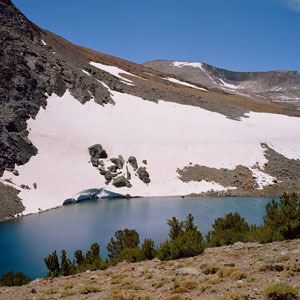 The high elevations are stark, with sparse vegetation, desert-like hills, small icy lakes, and lush meadows full of corn lilies. From just above Mono Pass we had views of the southern shore of Mono Lake and parts of the lake's basin. It was one of those hikes that made us wonder why the trail wasn't packed, because it was relentlessly beautiful. (Of course, it wasn't crowded because it is beautiful the way the desert can be: grand, harsh, and off the beaten path. Also, the air is very thin there.) We wound up at 11,100 feet at Parker Pass; since I didn't take a side trip to the shoulder of Mt. Lewis as Steven did, my hike was a 12 mile round trip, the farthest I'd traveled under my own power at any elevation since breaking my arm. Day 3, we had a day of rest, which meant that we milled around Tenaya Lake. The trail that goes around the lake was barely in use, with people primarily lounging at the eastern-most beach and picnic area. There are many lovely spots to sit on a rock and soak your feet in the cold, crystal-clear water. Day 4, we went on a 14 mile hike from a trail head on 120 to the Cathedral Lakes, Sunrise High Sierra Camp (not open for the season), over a ridge, and back down to Tenaya. Until the big descent to Tenaya, it was mostly climbing, and we lounged around quite a bit at my suggestion. We missed the last pre-dinner shuttle, and had to wait 90 minutes for the last shuttle of the day to collect us at the western Tenaya shuttle stop: I have never been so happy to see a shuttle bus as I was when the driver zipped past toward the last stop in the loop before coming to us. It was a good trip: I really needed the rest, the fresh (thin) air, the exercise, and the scenes of stark grandeur. By the way, according to Blogger, This is post 1,200 since I started this blog in 2002. Wow. Happily, Blogger is not also quantifying my posts in terms of coherence or interesting content.